Attendees of the recent Doha Watch and Jewellery Exhibition in Qatar got a first-hand look at Fabergé’s extraordinary $2 million “Pearl Egg,” the first “imperial class” egg released by the design house in nearly 100 years. 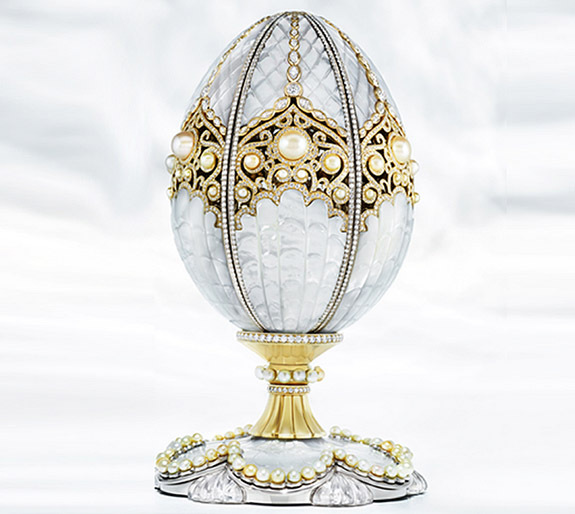 Set in white and yellow gold and gleaming with a mother-of-pearl exterior, the egg is adorned with 139 natural white pearls, 3,305 diamonds and carved rock crystal. Mimicking the way an oyster opens to reveal a cultured pearl, the Fabergé egg opens to reveal a unique, 12.17-carat grey natural pearl sourced from the Arabian Gulf. A special feature of the egg is that its entire outer shell rotates on its base, which simultaneously opens six sections to unveil the tiny treasures inside. The House of Fabergé collaborated with the Al-Fardan family of world-renowned pearl collectors to design the unique “imperial class” egg — just in time for the forthcoming centenary marking the last Fabergé Imperial Eggs ever delivered. The natural pearls adorning the egg were hand selected by Hussain Ibrahim Al-Fardan from his personal collection. 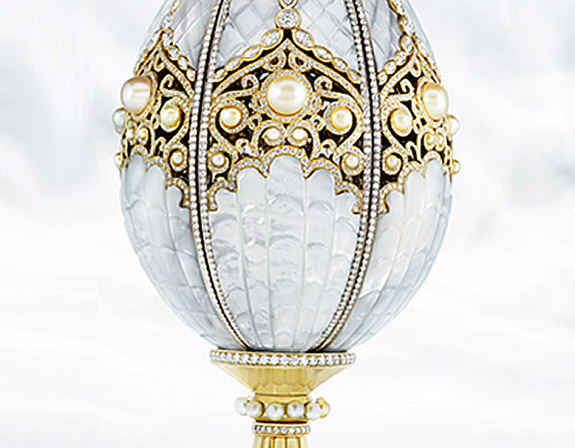 Peter Carl Fabergé and his company designed 50 bejeweled eggs for the Russian Imperial Family from 1885 to 1917. Alexander III and Nicholas II commissioned the most famous “Imperial” eggs as Easter gifts for their wives and mothers. The meticulously crafted objets d’art were produced up until the Russian Revolution, when the Fabergé family fled Russia. Until last year, eight of the 50 Imperial Easter Eggs had been unaccounted for. Then in March 2014, we learned that a Midwestern scrap metal dealer made the find of a lifetime when he unknowingly scooped up one of the missing Fabergé Imperial Eggs at a flea market for just $14,000. 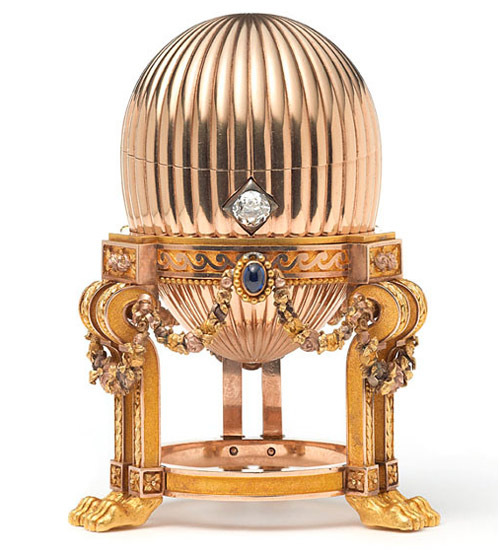 The buyer’s original intention was to make a quick profit by melting down the egg for its gold content, but he soon realized that he possessed a Fabergé egg that dated back to the late 19th century. The unnamed scrap dealer sold the egg to an anonymous collector for an undisclosed price, presumed by experts to be upwards of $33 million. 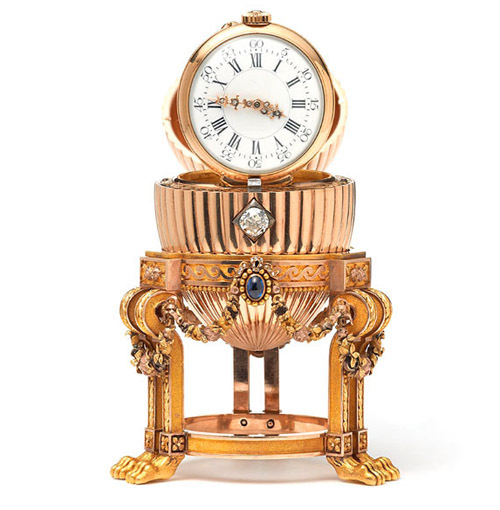 Images: “Pearl Egg” via Faberge; Flea market egg courtesy of Wartski. 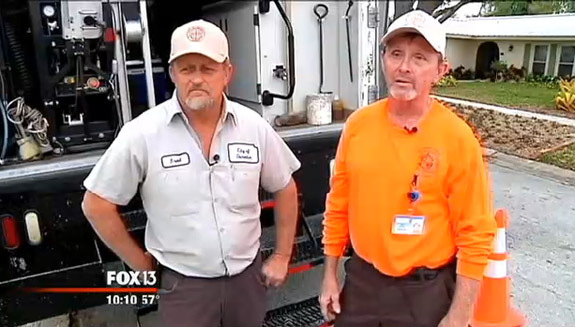 In Dunedin, Fla., two city workers are being hailed as "angels" for their heroic efforts in aiding a widow who accidentally flushed her cherished engagement ring down a toilet only two weeks after losing her husband to cancer. When Steve and Cindy Pike married in 1979, Steve couldn’t afford to buy the ring of Cindy’s dreams. 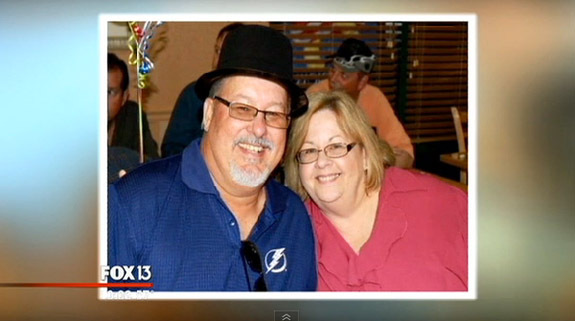 But, in October 2014, as the retired sheriff’s deputy battled multiple myeloma, he proudly presented his wife with a princess-cut diamond ring set in yellow gold with diamond accents on the band, according to FOX 13 in Tampa. "Thirty-five years later, he saved up enough money to get me my engagement ring that he had always wanted to give me," Cindy said. On January 29, Steve succumbed to his five-year fight with the aggressive blood disease and the ring became an even more important symbol of their love and life together. Then, only two weeks later, Cindy did the unthinkable. She accidentally dropped her new engagement ring in the toilet, and in one flush, it was gone. 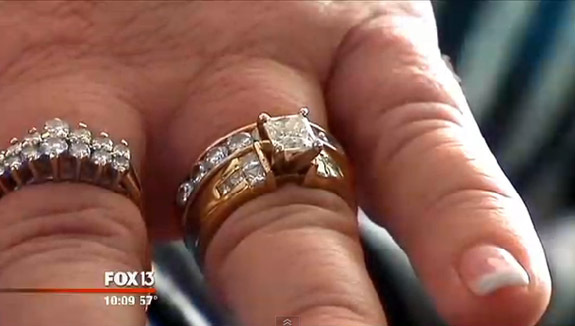 "It just went down and I screamed, thinking I'll never see this ring again," she told FOX 13. A local plumber told her there was no hope to get her ring back, but her friends advised her to call the City of Dunedin. City workers Jeff Givens and Brad Young arrived at her home with a plan — a plan they would implement on their own time. Four hours after their shift had ended, the dedicated city workers were back at Cindy’s house, running a flexible camera into her sewer line to try to view where the ring may have ended up. Eventually they found what they were looking for. "At that point, I felt pretty good that we were going to get it," Young said. 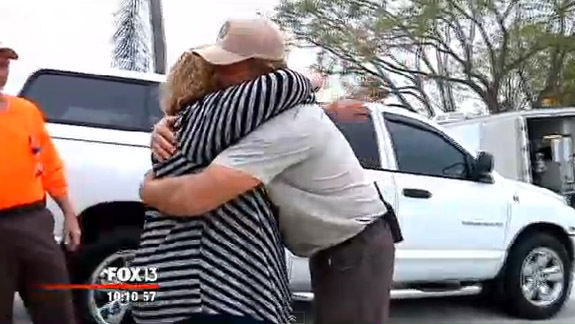 They dug a four-foot deep hole in her backyard to access the main pipe. Then, using a plastic bag as a filter and a high-power hose, they flushed her system. Then Cindy got the news she’d hoped for. 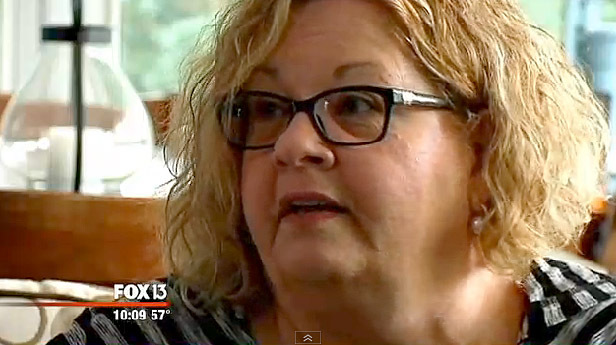 “Brad came to the door and said, ‘We see the ring,’” Cindy said. Cindy offered a monetary reward, but the men wouldn't take it. "Knowing what she was going through and in the stress that she was under, it meant a lot to me to be able to help her out," Young told FOX 13. The workers said that Cindy actually helped their efforts by not allowing any water to run in the house after the ring went down the toilet. When Queen Elizabeth II was coronated in 1953, the president and people of Brazil presented her with a necklace and matching pendant earrings that glistened with aquamarines and diamonds. The Queen was so enamored of the gifts that the parure soon grew to include a bracelet, brooch and tiara. 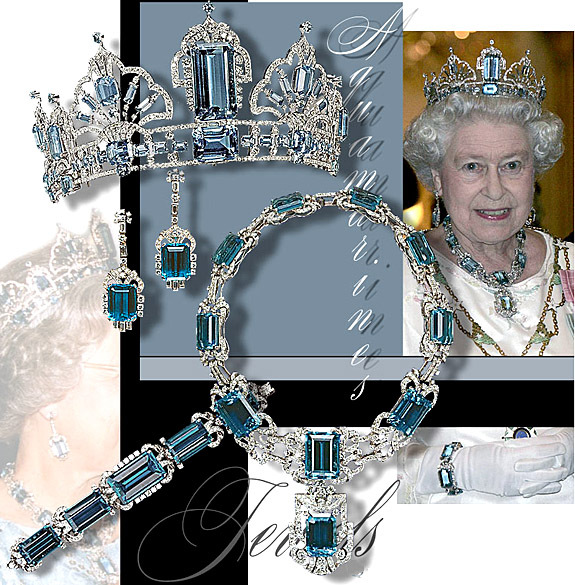 Today, the Queen’s aquamarine jewelry is the world’s most famous ensemble featuring March’s official birthstone. Legend states that it took the Brazilians one full year to collect the nine perfectly matched square-cut aquamarines and larger aquamarine drop pendant that made up the platinum necklace gifted to the Queen in 1953. Her Majesty loved the gift so much that she commissioned the royal jeweler Garrard to create a matching tiara in 1957. The tiara’s three large aquamarines were each detachable and could double as brooches. The large central stone of the tiara was originally the pendant that dangled from the necklace gift of 1953. One year later, the Brazilian government further delighted the British monarch with an add-on gift that included a lavish bracelet featuring seven large aquamarines set in a cluster of diamonds, and a square aquamarine brooch accented with diamonds. The tiara underwent a transformation in 1971 when it was redesigned to include four aquamarine-adorned scroll ornaments that were given to the Queen by the Governor of São Paulo in 1968. In September, Elizabeth II will become the longest reigning monarch in British history, surpassing the record held by her great-great-grandmother Queen Victoria. 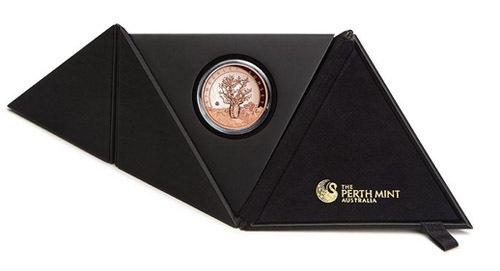 An Argyle pink diamond represents the sun setting behind an iconic 1,500-year-old boab tree in a brand new — and strikingly unusual — 22-karat pink gold coin unveiled Tuesday by The Perth Mint. Each coin in the limited mintage of 500 is hand set with a round .04-carat pink diamond. This is the first time a diamond has been incorporated into the design of an Australian legal tender gold coin. 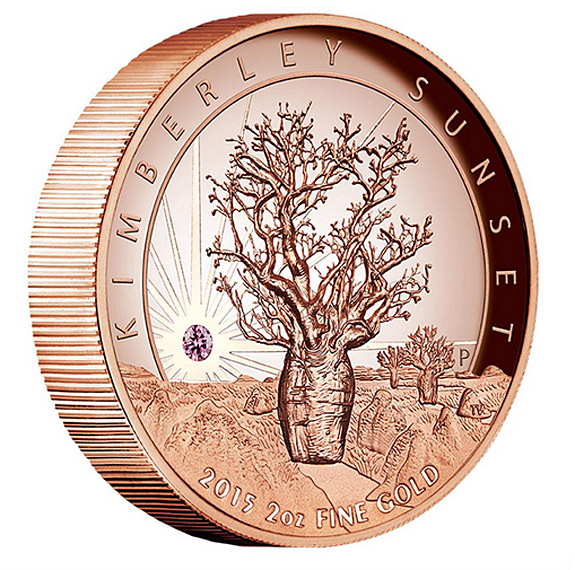 Named “Kimberley Sunset,” the stunning two-ounce coins celebrate the Kimberley region of Western Australia, where spectacular sunsets ignite the evening sky with vivid pink, orange, red, purple and blue hues. Kimberley is also home of Rio Tinto’s Argyle mine, which has produced 90% of the world’s pink diamonds, but is expected to cease operations in about five years. The 22-karat pink coins are made from 91.67% gold and 8.33% copper. (The copper gives the coin its the pink color). Each coin contains two ounces of pure gold. Each proof-quality coin has a denominational value of $500, but costs $6,000 to purchase. 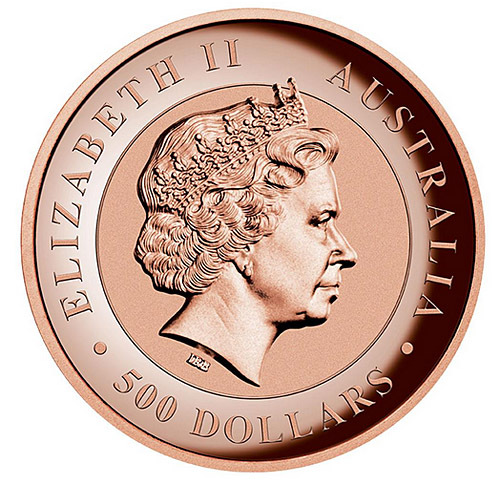 The coin’s obverse features the Ian Rank-Broadley effigy of Elizabeth II encircled by the Queen's name, the country of origin and the monetary denomination of "500 DOLLARS." 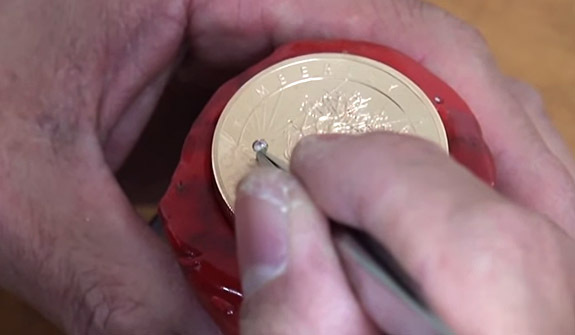 Each coin is housed in a black designer case and is accompanied by a numbered certificate of authenticity. 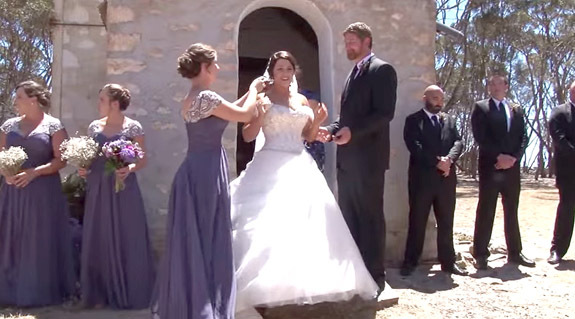 An Aussie bride interrupted her own wedding ceremony to perform an impressive rendition of Meghan Trainor’s brand new doo-wop-inspired release, “Dear Future Husband,” a song that lists a number of factors her beau needs to know about her before tying the knot. 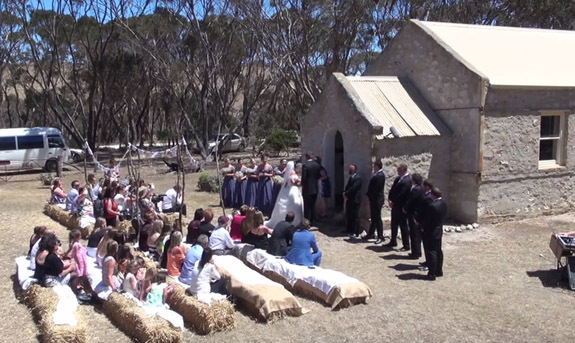 The bride from Adelaide, Tiffany Turner, is a huge Meghan Trainor fan — so much so that she decided to interrupt the clergywoman at her own wedding to serenade her husband-to-be William Banton with a few lyrical words of wisdom. But, before she could complete the word “matrimony,” Turner cut in. Then, one of Turner’s bridesmaids helped her secure a head-worn microphone, the music started and the rest is YouTube history. Turner’s performance of “Dear Future Husband” became a viral hit on the video-sharing website, with more than 121,000 views. 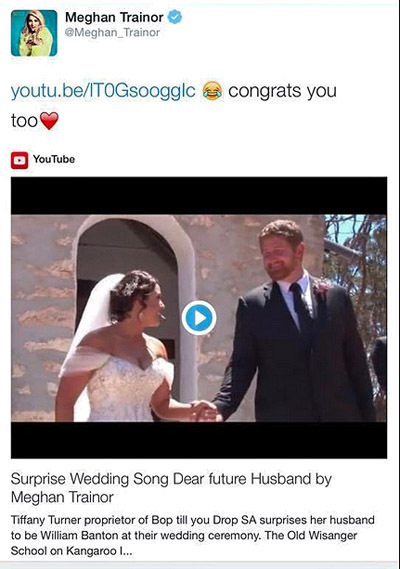 What’s even more impressive is that Meghan Trainor herself saw the video and offered the couple her best wishes via Twitter. On January 19, Trainor tweeted, “Congrats you too,” although she probably meant to say, “Congrats, you two.” Nevertheless, the talented bride — who happens to be the proprietor of kids party entertainment company “Bop Till You Drop” — was floored by the response. “Feeling famous, love it!” Turner commented on Twitter. “Dear Future Husband” is the third single released from Trainor’s studio album Title, which made its debut in January at the top of the Billboard 200 Album chart. Turner’s cover of Trainor’s soon-to-be Top 40 hit is guaranteed to make you smile. Check out the video and lyrics below. We’re also providing a second video of Trainor’s original version. The official music video has yet to be released, but the audio-only version has been viewed 25.5 million times. Enjoy. Written by Meghan Trainor and Kevin Kadish. Performed by Meghan Trainor. Fans of The Bachelor are eagerly awaiting tonight’s Season 19 finale when hunky Chris Soules will propose marriage to beautiful Whitney Bischoff or Becca Tilley with a double-halo-style diamond engagement ring. Bischoff, a fertility nurse from Chicago, is the odds-on favorite to win the heart of Soules, a stylish farmer from Iowa. At stake is an east-west-set emerald-cut diamond ring adorned with smaller round diamonds around the halos and along the band, which is likely crafted in 18-karat white gold or platinum. Glamour’s Kim Fusaro estimated the weight of the center diamond at 1.5 carats. 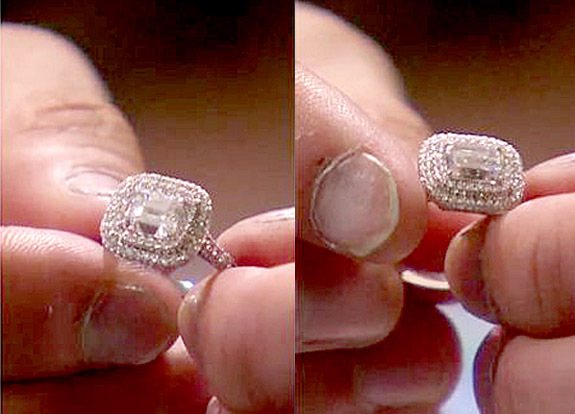 ABC offered a sneak peek of the engagement ring in a preview aired on last Monday’s Women Tell All special. The preview seems to indicate that Soules — unlike his predecessor, Juan Pablo Galavis — does, indeed, pick a winner in the season’s final rose ceremony. In Season 18’s controversial finale, Galavis stunned pediatric nurse Nikki Ferrell when he said, “I have a ring here in my pocket and I'm not going to use it. I'm not 100% sure I want to propose to you, but at the same time I'm 100% sure I don't want to let you go." Tonight’s episode should prove to be a little less dramatic, and either Bischoff or Tilley will emerge with a ring. Whether the winner will ever walk down the aisle with The Bachelor is a harder question to answer. 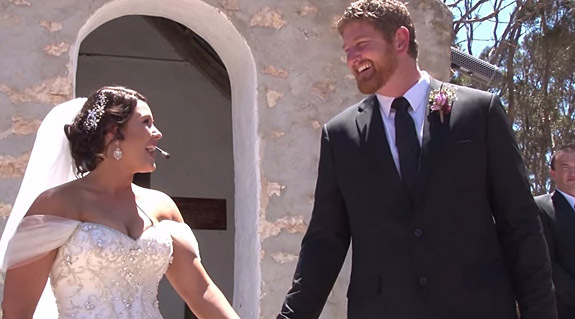 After 10 years of romantic matchmaking (18 seasons of The Bachelor) only one couple — Sean Lowe and Catherine Giudici of The Bachelor Season 17 — has tied the knot. 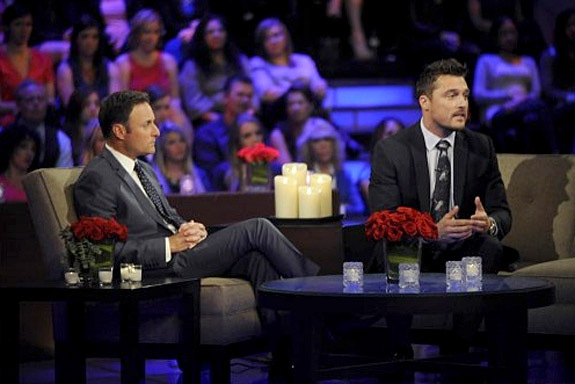 More than 8.5 million viewers are expected to tune in to the three-hour finale. 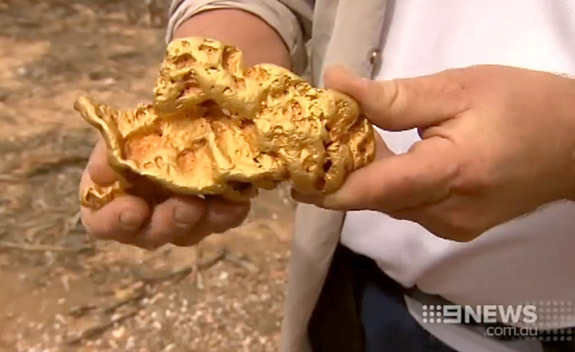 An Aussie prospector struck it rich when his metal detector pinpointed the location of an 87-ounce gold nugget that was buried barely six inches under the surface near the famous gold-bearing town of Wedderburn in Central Victoria. 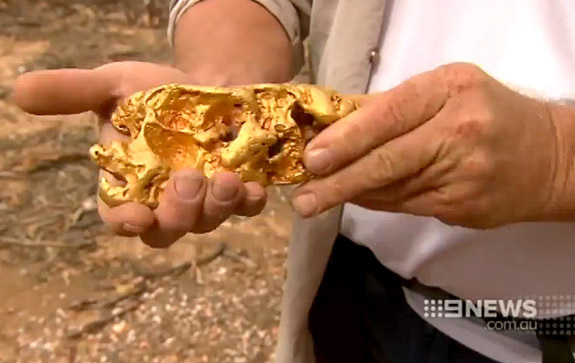 The “Fair Dinkum” nugget has a precious metal value of nearly $102,000, but 42-year-old Mick Brown from Kerang, Australia, believes his nugget will be worth twice that much to the right collector. 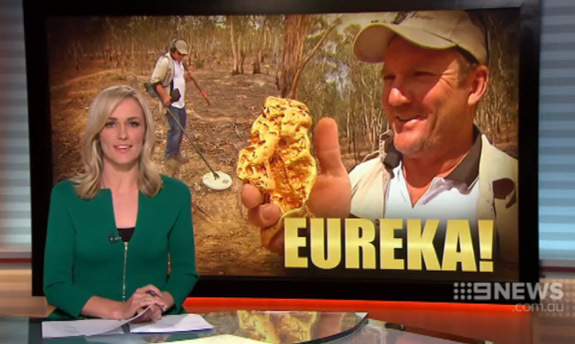 "Sometimes they do say, “Gold is worth twice its weight in gold if it's a really nice looking nugget,’" he told The Age. Brown is confident his nugget will earn top dollar. “It’s got good grooves and moves,” he said. In October 2014, a 97-ounce gold nugget found with a metal detector in Northern California’s fabled Gold Rush Country was sold to an anonymous buyer for $400,000. The lucky Aussie must thank his wife for encouraging him to get out of the house on the day he found the nugget. According to Brown’s account in The Age, he was irritable because he was a couple of weeks into giving up smoking. His wife advised him to leave the house for some fresh air. He ended up traveling 64 miles south to Wedderburn — a location he had prospected before. 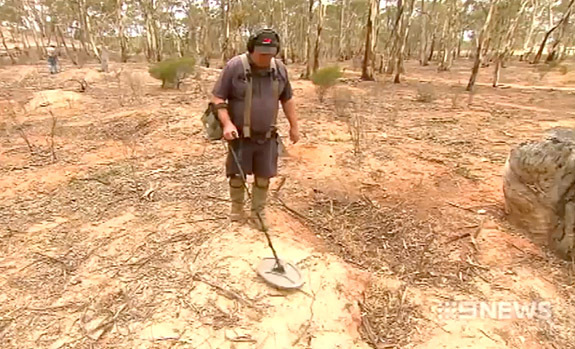 Brown described how his metal detector reacted to the huge chunk of gold in the ground. “That just blew me ears off, as you can imagine,” he said, referring to the alert signal from the device. After digging down only about six inches, he was able to grab onto the horn-like protrusions of the “Fair Dinkum” nugget and pulled it from the ground. At first he thought it was a big blob of copper, but then he realized it was gold. He “cracked a can” (drank a beer) to celebrate. Brown did not reveal the exact location of his find for fear of starting a gold rush. 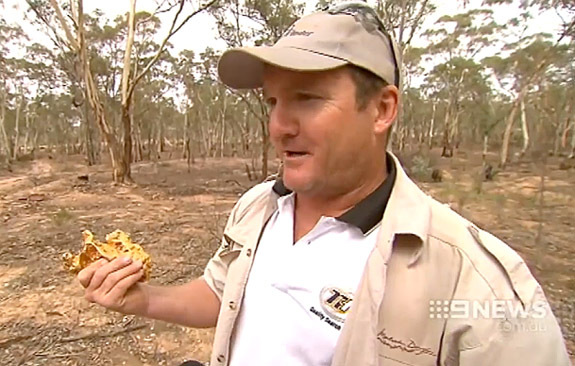 He wasn’t shy, however, about showing off the “Fair Dinkum” nugget. "[Am I supposed to say,] 'Yeah, I've found a nugget, but you can't look at it?'" he quipped. "It's cool [to show it], and it's given everyone a good little rev up." Brown reported that with the money earned from the sale of the nugget he will purchase a home spa for his wife and four daughters. Despite his big payday, Brown is still motivated to bring home an even bigger nugget one day. "There are some big 10 kilo jobs out there," he said. Brown’s “Fair Dinkum” — although sizeable — is far from the largest nugget to emerge from the Aussie countryside. In 1981, the 256-ounce “Pride of Australia” was unearthed nearby in Mosquito Gully, just north of Wedderburn. Millions of Girl Scouts — both former and present — are encouraged to wear pearls this week to honor the 100th anniversary of founder Juliette “Daisy” Gordon Low's selfless act of generosity that allowed the organization to survive and prosper. In 1915, only three years after its inception, the growing organization was in desperate need of funds. To support the movement for another year, Low sold her dearly loved natural pearls — a wedding present from her husband — for $8,000. A photo portrait of Low featured on a Girl Scout regional website shows the founder wearing what appears to be a 30-inch-long rope of matched natural pearls. These could very well be the pearls she used to finance her organization. According to various sources, Low dedicated almost all of her personal assets to pay for the expenses of the movement. The magnitude of her sacrifice comes into clearer focus when one translates what $8,000 would be worth in today’s dollars. The answer is a staggering $185,989. We can fairly assume that her pearls were natural because the patent for the process of culturing pearls would be granted to Japan’s Tokichi Nishikawa one year later, in 1916. 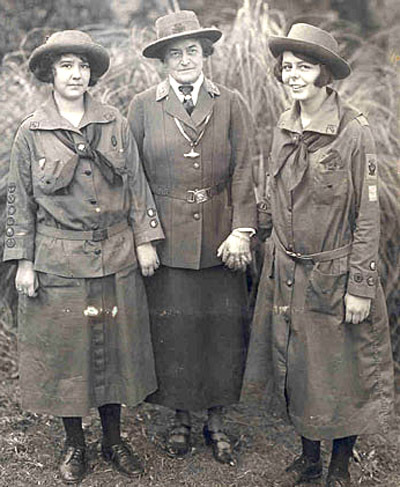 On March 12, 1912, 18 girls from Savannah, Ga., gathered for what would be the first meeting of Girl Scouts (then called the Girl Guides). 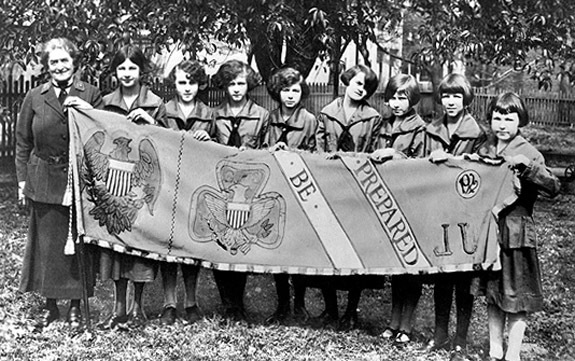 Under Low’s leadership, the Girl Guides were incorporated as Girl Scouts, Inc., in 1915, and rapidly grew to include 10,000 girls in 328 cities by 1916, according to The New York Times. Now in its 103rd year, the organization claims that more than 59 million American women have been part of Girl Scouting at some point in their lives. Many young scouts will be receiving faux pearl necklaces during Girl Scout Week, which runs through March 14. The pearl gifts are intended to inspire the girls to continue Low’s legacy by “giving back” through service projects. 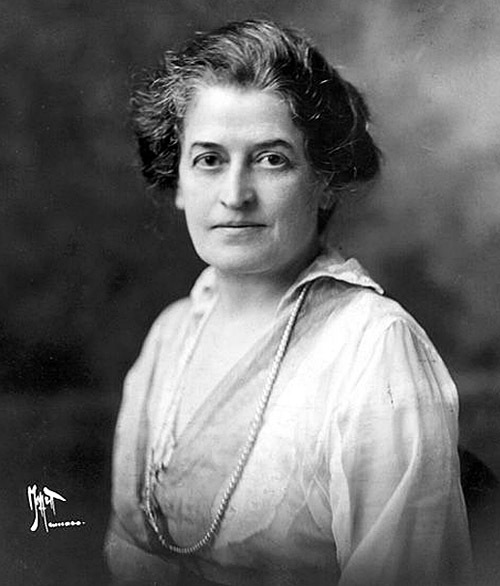 Photo portrait of Juliette Gordon Low via GirlScoutsCCC.org; Other images: Wikicommons. Three spelunkers exploring a stalactite cave in Israel’s Galilee region found a cache of silver jewelry and coins dating back to the era of Alexander the Great — more than 2,300 years ago. The jewelry included a pair of intricately crafted silver earrings, as well as unusual rings and an assortment of bangle bracelets. The coins feature an image of Alexander the Great, who conquered the region in the late fourth century B.C. The opposite side of the coin has an image of Zeus sitting on his throne, arm raised as if he were throwing a lightening bolt. 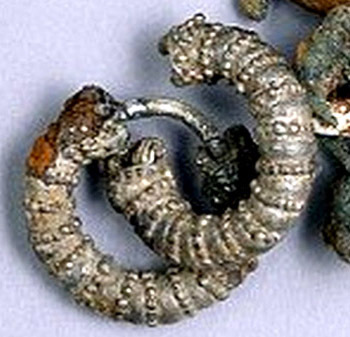 The earrings were of particular interest to the Israeli Antiquities Authority (IAA) due to their remarkably good condition and detailed workmanship. IAA authorities believe that refugees hiding during a period of governmental unrest after the death of Alexander stashed the items in the cave with the intention of returning to claim them at a later time. Dr. Eitan Klein, deputy director of the Unit for the Prevention of Antiquities Robbery, noted that the quality of the items seem to indicate that the refugees may have been affluent. “The items were expensive, both in ancient times and today," he said, adding that the style of silver rings has not been seen before. A set of agate beads found inside a clay oil lamp was particularly well preserved, according to Klein. "They look brand new, like they were just bought," he said. Three members of the Israeli Caving Club — Reuven Zakai, his son Chen Zakai, and friend Lior Haloney — are credited with the discovery. After wriggling through a narrow passageway, Chen spotted a silver shiny object peeking out from a small crevice. The jewelry and coins were originally stashed in a cloth bag, according the IAA. 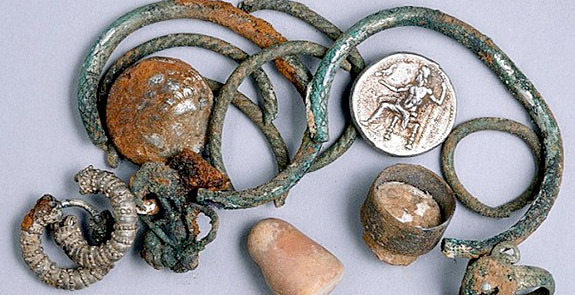 The bag had deteriorated after 2,300 years, but the silver jewelry and coins were in remarkably good condition and will give archaeologists new insights into the society of ancient Israeli. The caving club members immediately reported their discovery to the IAA, which explored the site and found addition artifacts, some dating back 6,000 years. The exact location of the find will remain a secret to prevent looting. Images: Israeli Antiquities Authority; screen captures via CNN.com. Released on Wednesday with an exclusive premiere on Billboard.com, “Gold” alludes to the band's six-year-long, often-bumpy ride to the top of the charts, and how they overcame adversity and never took their eyes off the prize. Quinn explained his inspirations for writing the song. “It kind of goes back to those early days of us touring in a van and the experience of touring, getting where you needed to go, not being afraid," Quinn told Billboard.com. "When you're coming up as a band you have this excitement. The only place to go is forward. So that was kind of the idea for me, thinking about the climb and the getting there, some of the most exciting parts of the journey of being in a band and being an artist, creating songs in your garage. That's where the song started for me." 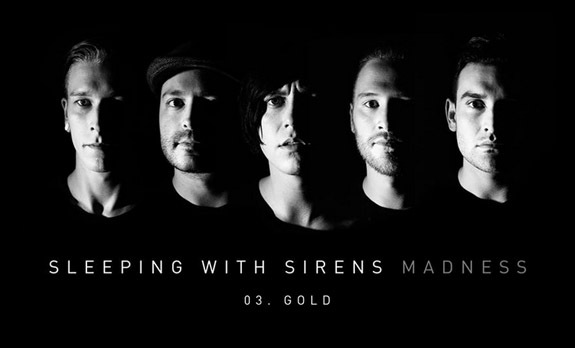 “Gold” is the third track from the band’s album, Madness, which is set to release on March 17. Billboard.com is predicting that Madness will debut in the top 5 on the Billboard 200 album chart. The band’s previous album made its debut at #3 on the album chart. Sleeping With Sirens, which boasts three million Facebook followers, is currently on the European leg of a five-month world tour, which started in Fresno, Calif., in November and will end in London next month. Written by Kellin Quinn. Performed by Sleeping With Sirens. Couples spent an average of $5,855 on their engagement rings in 2014, an increase of 5% compared to 2013, according to a national survey of 16,000 newly married brides conducted by The Knot. Overall wedding budgets are also on the rise, with the average tab in 2014 coming in at $31,213, up from $29,858 in 2013. By far, the biggest part of the wedding budget was dedicated to the venue, with the reception hall costs tallying $14,007, a jump from $13,385 a year before. The engagement ring ranked as the bridal couple’s second-highest expense, followed by the reception band ($3,587), photographer ($2,556), florist/décor ($2,141), wedding/event planner ($1,973), ceremony site ($1,901), videographer ($1,794), wedding dress ($1,357), rehearsal dinner ($1,206), reception DJ ($1,124), transportation/limousine ($767), ceremony musicians ($637), wedding cake ($555) and invitations ($439). The honeymoon was not included in these statistics. Although wedding budgets are on the rise, guest lists are shrinking. “The average wedding now has 136 guests, down from 149 in 2009," said Rebecca Dolgin, Editor in Chief of The Knot. "Couples are focusing on creating an amazing guest experience and reception details, including finding unique venues to reflect their personality." According to The Knot, more and more bridal couples are stepping out of the box to find unusual wedding sites — such as historic buildings/homes (14%) and farms (6%) — that better reflect their personalities. This compares to the more conventional, and still popular, venues, such as banquet halls (22%), country clubs (11%) and hotels (11%). Certainly, regional factors play a big part in what a wedding will cost. The most expensive places to get married are Manhattan ($76,328) and Long Island ($55,327), while the least expensive places to tie the knot are Utah ($15,257) and Arkansas ($18,031). The Knot reported that the bride’s parents and the bridal couple each contributed equally (43%) toward wedding expenses. The groom’s parents pitched in for 12% and “others” accounted for the remaining 2%. • The average marrying age is 29 for a bride and 31 for a groom. The oldest brides are from Nevada (32.7) and New York City (32), while the youngest brides hail from West Virginia (26.8) and Kentucky (26.9). • The average length of an engagement is 14 months. Brides from Utah and West Texas reported the shortest engagements (10 and 9.9 months, respectively), while brides from Northern New Jersey and western Pennsylvania reported the longest engagements (18 and 17.5 months, respectively). • The most popular months to get married are June (15%), October (14%). The Knot’s “2014 Real Weddings Survey” reflects the responses of nearly 16,000 U.S. brides married between January 1 and December 31, 2014. 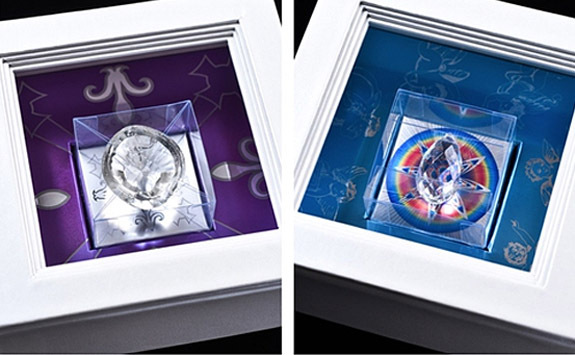 Utilizing a top-secret formula that gives its candy a flawless transparency, a Japanese confectioner has released a new line of premium treats that mimic the world’s most famous diamonds. 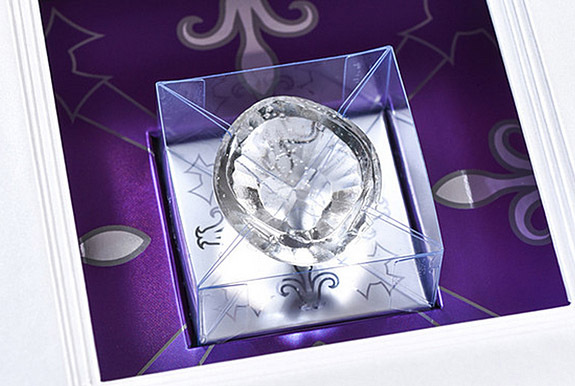 Among the notable diamonds replicated by Tokyo-based candy maker Ameya Eitaro are the 105-carat Koh-i-Noor and the unusual 16-sided, 36-carat Pasha of Egypt. It took the company several years to come up with a candy formula that yielded the transparency to mimic a priceless jewel. Apparently, the firm used alternatives to conventional sugar and starch syrup. Each candy jewel, which is said to have a “simple, sweet taste,” is packaged in a decorative jewelry box and sells for approximately $31. The Koh-i-Noor replica has a diameter of about 4mm (1.57 inches). “Candies have always been something vibrant and shiny, and we wanted to develop them into products that resemble jewelry,” a spokeswoman at Eitaro Sohonpo Co. told the Wall Street Journal’s Japan Real Time blog. 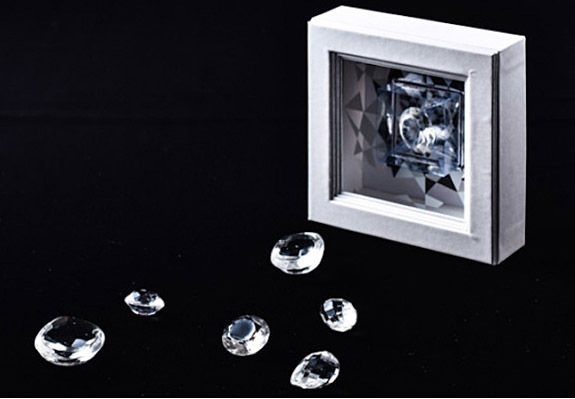 The diamond candies made their debut last week at two of Japan’s high-end department stores — Ginza's Mitsukoshi and Isetan in Shinjuku. The release was timed to coincide with “White Day,” an annual celebration that comes on March 14, exactly a month after Valentine’s Day. Unlike in the U.S., where Valentine’s Day marks a romantic gift exchange between men and women, Valentine’s Day in Japan is different. It’s designated as a special time for women to express their love by presenting gifts to men. White Day is the flip side, when men get a chance to reciprocate with gifts that are typically white in color, such as white chocolate, cookies, jewelry or, now, glistening candy diamonds. Images: Courtesy of Eitaro Sohonpo Co. 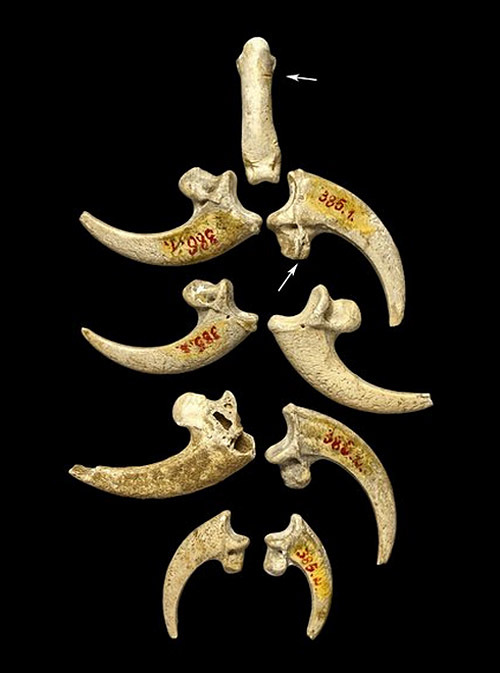 Anthropologists at the University of Kansas claim that fashionable Neanderthals wore handcrafted jewelry made from eagle talons 130,000 years ago. The eagle talon adornment, shown here, could very well be the world's oldest jewelry. A new study published in the journal PLOS ONE suggests that the Neanderthals who predated modern humans were much more intelligent and style-conscious than previously believed. Study author David Frayer, an anthropology professor at the University of Kansas, based this assumption on a collection of eight white-tailed eagle talons that were excavated 100 years ago from a cave in present-day Croatia. At the time of the find, the talons didn’t seem to be unusual, but on further inspection, it was determined that the talons had notches and tool marks on them, indicating that they were strung together either as a necklace or bracelet. "It really is absolutely stunning," Frayer told Live Science. "It fits in with this general picture that's emerging that Neanderthals were much more modern in their behavior." The talons were just a few of the thousands of items extracted from a cave between 1899 and 1905 by Croatian scientist Dragutin Gorjanovic-Kramberger. Although the original find yielded valuable information about Neanderthals, the tooling that allowed the talons to be used for body ornamentation was discovered only recently. "I was stunned," Frayer told CNN. "It's so obvious that these are cut." 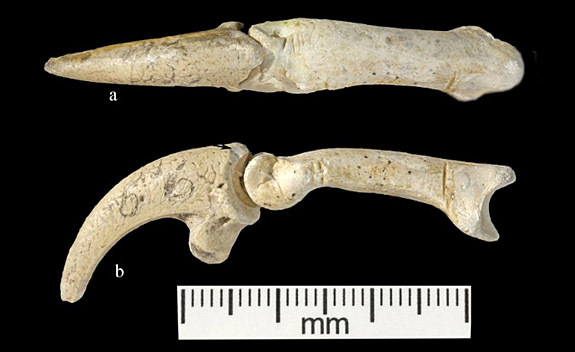 Frayer and the co-authors of "Evidence for Neanderthal Jewelry: Modified White-tailed Eagle Claws at Krapina" surmised that the Neanderthals were also catching the eagles, whose talons they harvested for jewelry. Even today, catching an eagle is no easy feat, so the anthropologists believe the Neanderthals must have developed excellent “planning skills and ritual” to pull off such a formidable challenge. "Neanderthals are often thought of to be simple-minded mumbling, bumbling, stumbling fools," Frayer told CNN. "But the more we know about them the more sophisticated they've become." Scientists believe that Neanderthals appeared in Eurasia between 200,000 and 250,000 years ago and died out about 40,000 years ago. The model of an adult Neanderthal male (shown above) is on display in the Hall of Human Origins in the Smithsonian Museum of Natural History in Washington, D.C. Credits: Talon jewelry: Luka Mjeda. 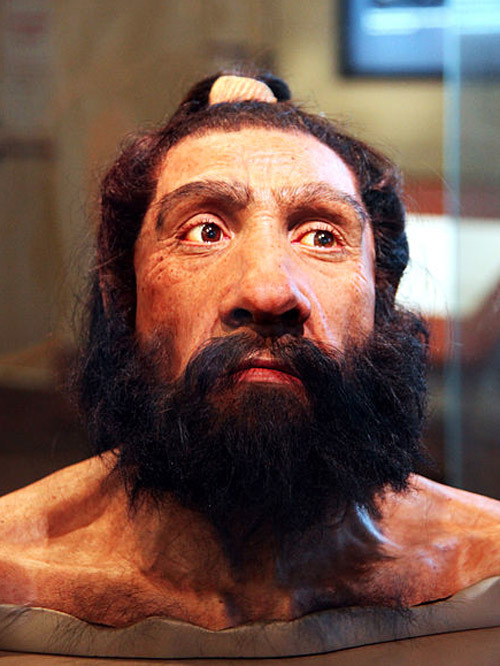 Neanderthal: By reconstruction: John Gurche; photograph: Tim Evanson CC BY-SA 2.0, via Wikimedia Commons. 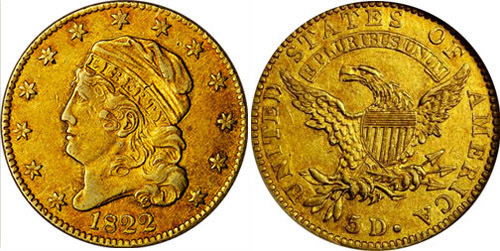 Two astonishingly rare and highly coveted coins — an 1822 Half Eagle $5 gold piece and an 1804 Silver Dollar — could each shatter the $10 million single coin record when they hit the auction block at Sotheby’s New York on May 19 and 20. Both headliners are from the incomparable D. Brent Pogue Collection of early U.S. coins, a trove of 650 gold, silver and copper specimens expected to be the most valuable collection of currency ever sold at auction. Mint records indicate that 17,796 Half Eagles were coined in 1822, but only three survive. The Half Eagle up for bid at Sotheby’s is the only privately held example in existence. The other two are part of the National Numismatic Collection in the Smithsonian Institution. 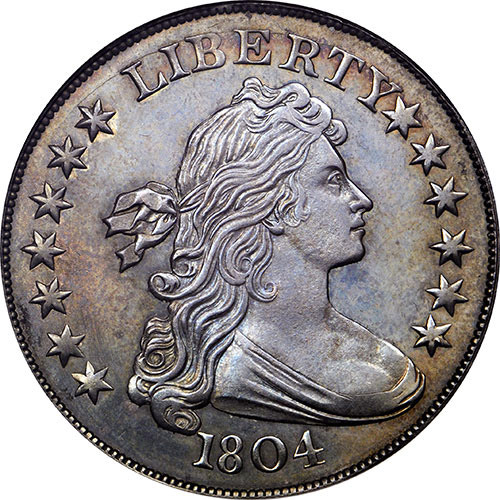 The 1804 Silver Dollar is frequently dubbed the "King of American Coins." Although they were dated 1804, the coins were actually made in 1834 or 1835 on behalf of President Andrew Jackson, who intended to use them as diplomatic gifts. The one offered for sale at Sotheby's is considered the finest known example of the coin. Only eight still exist. “These two coins in particular, we think, have a possibility of being up around that $10 million mark," Brian Kendrella, the president of Stack's Bowers Galleries, told Reuters. If either coin eclipses the $10 million mark, it will overtake the record set in 2013 for a 1794 Silver Dollar. Dallas real estate developer A. Mack Pogue and his son, D. Brent Pogue, began their famed coin collection in the 1970s, and patiently assembled top-notch rarities for the next 30 years. 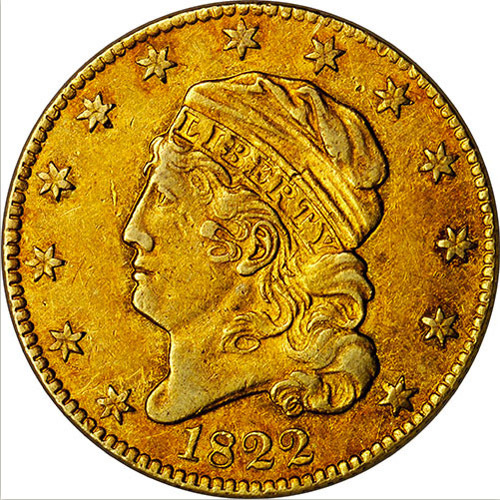 The collection’s primary focus is on the first coins produced by the United States between 1792, the year the Philadelphia Mint opened, and the late 1830s, according to the Sotheby’s website. Reuters reported that sales of rare U.S. coins reached a record of nearly $536 million in 2014, but that record is likely in jeopardy with the D. Brent Pogue Collection hitting the market this year. Welcome to Music Friday when we bring you fun songs with jewelry, gemstones or precious metals in the lyrics or title. 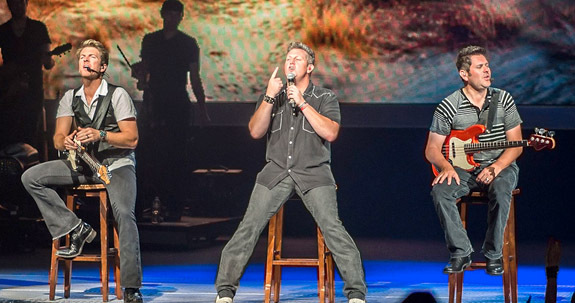 Today, Rascal Flatts sings about the magic that happens when you play a country song backwards. The fun 2006 ditty, appropriately titled “Backwards,” explains how playing a country song in reverse essentially gets you a free pass to hit the restart button on your adult life. Sung from the point of view of a “old boy” who has been through hard times, “Backwards” delivers an up-tempo, foot-stomping laundry list of all the things he’d get back if he could magically rewrite his personal history. One of those things is a diamond ring. “Backwards” is the fourth track from Rascal Flatts' five-time platinum album Me and My Gang, which sold five million copies and scored the #1 spot on the U.S. Billboard Top 200 albums chart. The song also appeared three years later on the soundtrack of Hannah Montana: The Movie, which also hit #1 on the Billboard album chart. The song is prominently featured in a pivotal scene when Miley Cyrus’ character, Miley Stewart, arrives home to find her extended family jamming to the song in her living room. She mimics a few lines from the song and then says, “I want my life back, Dad.” A clip of the scene in which the members of Rascal Flatts make a musical cameo is below. Rascal Flatts, which is composed of Gary LeVox, Jay DeMarcus and Joe Don Rooney, was established in Columbus, Ohio, in 1999. The band is credited with a dozen #1 songs on the Billboard Hot Country Songs chart and is a top-selling touring act. The group sold more than 7 million tickets between 2004 and 2012. We have two videos below. The first is an acoustic video of the group performing “Backwards.” The second is the clip from Hannah Montana: The Movie. The lyrics are below if you’d like to sing along. Written by Marcel Francois Chagnon and Tony Carl Mullins. Performed by Rascal Flatts. When you play a country song backwards?" Skygazers visiting the Faroe Islands to see a rare total solar eclipse on Friday got an added bonus when the perfect alignment of the Earth, Moon and Sun yielded a wondrous celestial display that looked remarkably like a diamond ring. The Diamond Ring Effect, which was first explained by Francis Baily in 1836, occurs when the Moon completely masks out the Sun during a total solar eclipse. Due to the rugged lunar landscape, the black outline of the moon is not smooth. Tiny beads of sunlight can still shine through in some places and not in others as the moon slowly grazes past the sun. 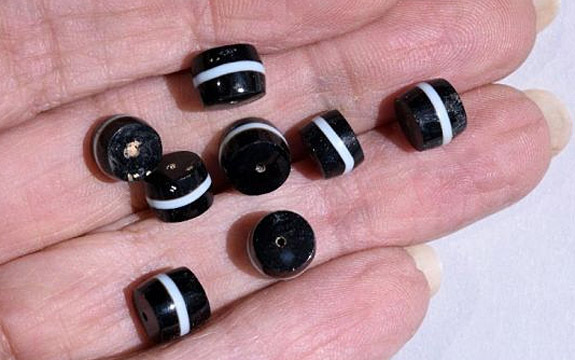 These are called Baily’s Beads. When only one dazzling “bead” remains, momentarily, the view of the eclipse resembles a diamond ring. The ring’s glow is produced by the Sun’s corona remaining dimly visible around the lunar silhouette. The Diamond Ring Effect actually happened twice on Friday. The first time occurred in the 8 o’clock position of the Sun in the moment just before the total eclipse, and the second occurred in the 4 o’clock position just after the total eclipse. The solar eclipse lasted for 2 minutes and 47 seconds. To get the optimal view of the eclipse, observers had to travel to the remote Faroe Islands, which are located between Iceland and Norway. People living in Europe and North Africa saw a partial eclipse on Friday. A total solar eclipse occurs when the Moon passes between the Earth and Sun, thereby completely hiding the Sun from viewers on the Earth. Because the apparent diameter of the Moon is larger than the Sun’s, it blocks all direct sunlight and makes daytime appear to be night. The next solar eclipse is scheduled to take place over Indonesia in March 2016, according to NASA. The previous one took place over Australia in November 2012. Total solar eclipses have occurred in the U.S. only two times in the past 40 years, in 1979 and 1991. The next one will happen in August 21, 2017, and will be visible from coast to coast. The maximum point of the eclipse will take place near Hopkinsville, Ky., at 6:22 p.m. 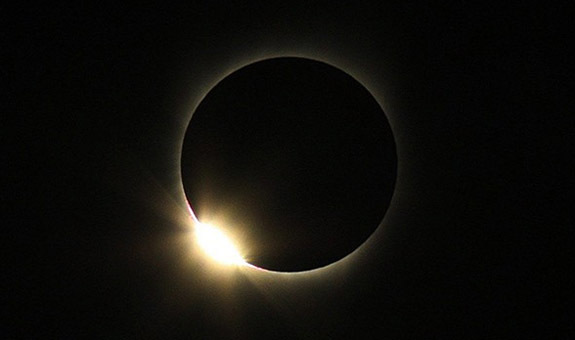 Check out the BBC video of Friday's total solar eclipse and dazzling Diamond Ring Effect, below. Images: Screen captures via YouTube.com/BBC; NASA. A one-of-a-kind, $1 million emerald belt is awaiting the winner of the “Fight for Eternity,” the highly anticipated welterweight super bout between Floyd Mayweather Jr. and Manny Pacquiao. Set to take place on May 2 at the MGM Grand in Las Vegas, the championship fight pits Pacquiao, the winner of world titles in eight divisions, against Mayweather (47-0), who has belts in five weight classes. The match has been nearly six years in the making. The $1 million emerald belt will be a bonus in a contest that promises to deliver a mammoth payday to both participants. 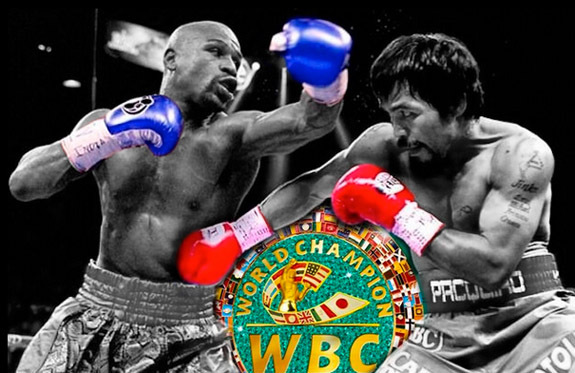 The combatants will share $300 million — 60% for the 38-year-old Mayweather and 40% for the 36-year-old Pacquiao. 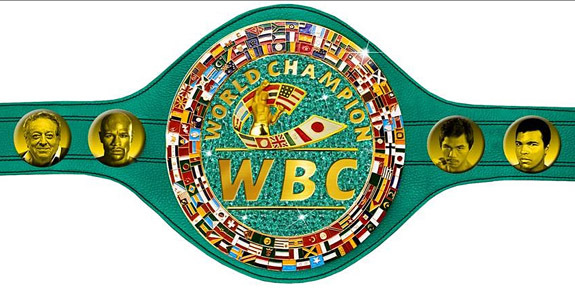 The World Boxing Council (WBC) originally commissioned two championship belt designs to commemorate the monumental event. One featured the WBC logo in gold against a ground of emeralds. An alternate design swapped the emeralds for onyx. Fight fans visiting the WBC web site were encouraged to vote for their favorite design. As voting ended last week, we were surprised to learn that the far-more-precious emerald version won by the narrow margin of 53% to 47%. The emerald belt was described by the WBC as an “exquisite masterpiece designed by the World Boxing Council for a unique bout that is already gracing the pages of boxing history.” The May 2 event is expected to shatter records for gate receipts and Pay-Per-View buys. Both Pacquiao and Mayweather already own diamond versions of the WBC belt. Pacquiao got his for defeating Puerto Rican Miguel Cotto in 2009. Mayweather earned his for beating Mexico’s Saul “Canelo” Alverez in 2013. The 77.77-carat fancy vivid yellow “Lady Luck Diamond” could fetch $7.7 million when it hits the auction block at Sotheby’s Hong Kong in April. Sotheby's top lot clearly has auspicious ties to the number seven, a fact that should widen the diamond's appeal at auction. For the Chinese, seven is a lucky number that also signifies togetherness. In the West, seven is considered the luckiest of all numbers and many a gambler has dreamed of a 7-7-7 slot machine jackpot. 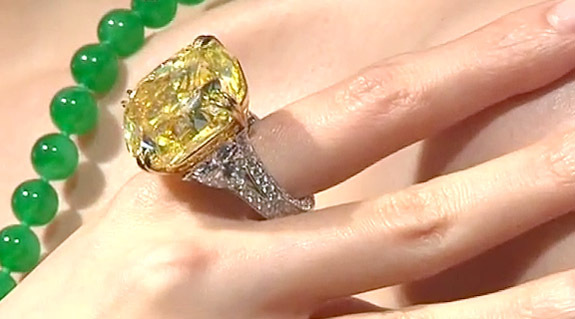 For potential Asian buyers, the vivid yellow color of the diamond is desirable because it symbolizes royalty and power. The cushion-cut, VS2 clarity “Lady Luck Diamond” is flanked by two 5-carat heart-shaped white diamonds in an 18-karat white and yellow gold ring. The ring mount is detachable so the impressive yellow center diamond can double as a pendant. Pure yellow diamonds owe their color to the faint presence of nitrogen atoms in the diamond’s crystal structure. Vivid yellow diamonds, which boast the most intense saturation of color and superb golden hue, are extraordinarily rare. When fine-quality diamonds of this type are offered in sizes 30 carats and larger, collectors and diamond connoisseurs take notice and are willing to pay premium prices. In 2011, Sotheby's Geneva achieved an auction record for the sale of “The Sun-Drop Diamond” (renamed “The Lady Dalal”), a 110.03-carat pear-shaped fancy vivid yellow diamond weighing 110.03 carats. It sold for $12.36 million and was one of the largest diamonds ever to appear at auction. 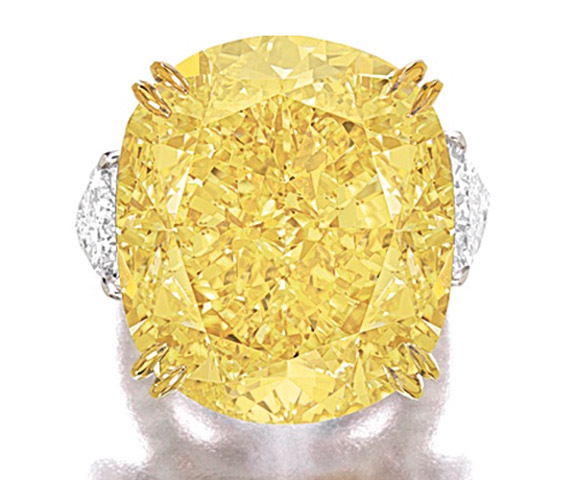 In May 2014, the 100.09-carat Graff Vivid Yellow achieved a world auction record price of $16.34 million, according to Sotheby’s. The "Lady Luck Diamond" carries a pre-sale estimate of $6.8 to $7.7 million. Sotheby's "Magnificent Jewels and Jadeite Spring Sale 2015" will take place at the Hong Kong Convention and Exhibition Center on April 6. The sale will highlight 320 lots, including rare colorless and colored diamonds, gemstones and signed jewels from the 1930s. The auction is expected to generate more than $99 million in total sales. Gem images via Sothebys.com; Screen capture via NTD.tv. In 1963, Pop art pioneer Roy Lichtenstein earned $1,000 for his comic-book-style painting called “The Ring (Engagement).” On May 12, Sotheby’s will be asking $50 million for the same work of art. “The Ring (Engagement)” is one of Lichtenstein’s largest paintings at 48 inches by 70 inches and depicts a close-up view of a man placing a diamond engagement ring on a woman’s finely manicured finger. In the background is a web-like formation of tapered red crystals. Interestingly, “The Ring (Engagement)” has had only two owners since Lichtenstein painted it in 1962. French collector Jean-Marie Rossi bought it from the artist’s gallery in 1963 for $1,000 and sold it for $2.2 million to Chicago businessman Stefan Edlis in 1997, the same year Lichtenstein passed away at the age of 74. Sotheby’s noted that the painting "encapsulates all of the major themes" in Lichtenstein's "most acclaimed and sustained body of work." The Manhattan-bred artist, who was a contemporary of Andy Warhol, often used comic strips and popular media as inspiration. 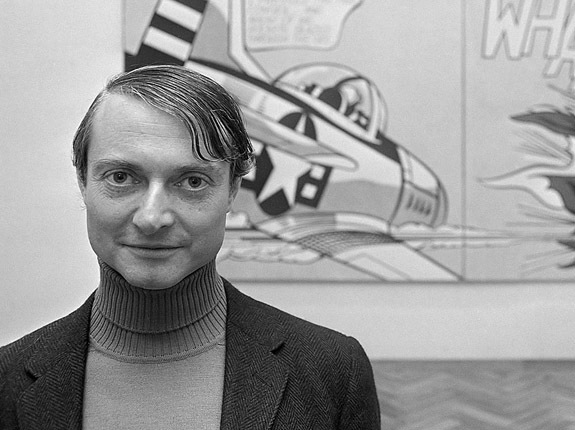 According to ArtNews.com, Lichtenstein created a series of paintings based on scenes from love and war comic books during a three-period starting in 1961. “The Ring (Engagement)” is from that series. The work demonstrates the artist’s signature usage of Ben-Day dots, which are small colored dots that are either tightly spaced or widely spaced on a white background to trick the eye into seeing other hues. Widely spaced red dots, for example, would be perceived as pink. The pricing of the bright red painting reflects a booming market for Lichtenstein’s works. Two years ago, Lichtenstein’s “Woman With Flowered Hat” sold for $56.1 million at Christie’s New York. “The Ring (Engagement)” can be previewed at Sotheby’s Los Angeles today, March 26, and will hit the auction block at Sotheby's Contemporary Art Evening Sale on May 12 in New York. 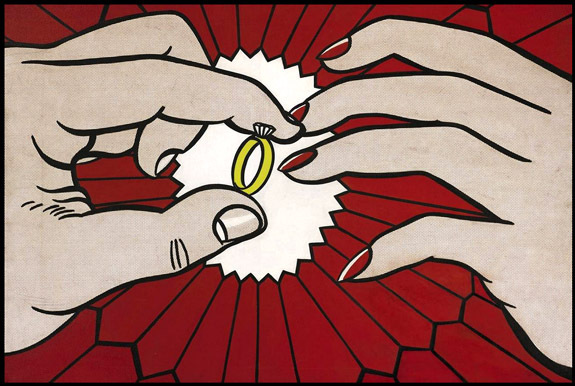 Credits: “The Ring (Engagement)” photo via Sotheby’s; Roy Lichtenstein image via Wikicommons. Written by Norman Whitfield, Barrett Strong and Janie Bradford, “Too Busy Thinking About My Baby” was first recorded by The Temptations in 1966, but attained huge commercial success when Gaye released his cover version three years later. The song peaked at #4 on the Billboard Hot 100 chart, sold more than 1.5 million copies and was the top R&B single of the year. "Too Busy Thinking About My Baby" became Gaye’s second biggest hit the 1960s, trailing only his iconic "I Heard It Through the Grapevine" — another Whitfield/Strong collaboration — which ascended to #1 on the charts in 1968 and sold more than 4 million singles. Born Marvin Pentz Gay Jr. in 1939, in Washington, D.C., the singer co-founded a local doo-wop group, the Marquees, which later became the Moonglows. When the Moonglows’ tour arrived in Detroit, Motown executives noticed Gaye’s talent and signed him to a deal. Proclaimed the Prince of Motown and Prince of Soul, Gaye enjoyed a stellar career that flourished throughout the 1960s, 1970s and early 1980s. At the height of his success, Gaye's life came to a tragic and abrupt end. On April 1, 1984, only one day before his 45th birthday, Gaye was senselessly shot to death by his father. 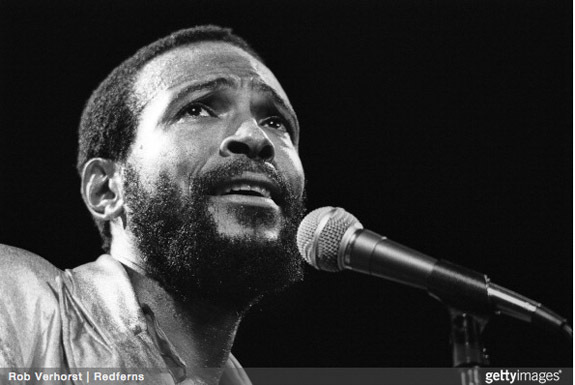 Although he’s been gone for more than 30 years, Gaye’s music and influence lives on. After his death, he was inducted into the Rock and Roll Hall of Fame, Rhythm and Blues Music Hall of Fame and won a Grammy Lifetime Achievement Award. He also earned the #6 spot on Rolling Stone’s list of the 100 Greatest Singers of All Time. "Too Busy Thinking About My Baby"
Written by Norman Whitfield, Barrett Strong and Janie Bradford. Performed by Marvin Gaye. A raw gem crystal "Tree of Life" necklace is credited with saving the life of a Tennessee woman who was shot in the chest by a would-be bank robber. 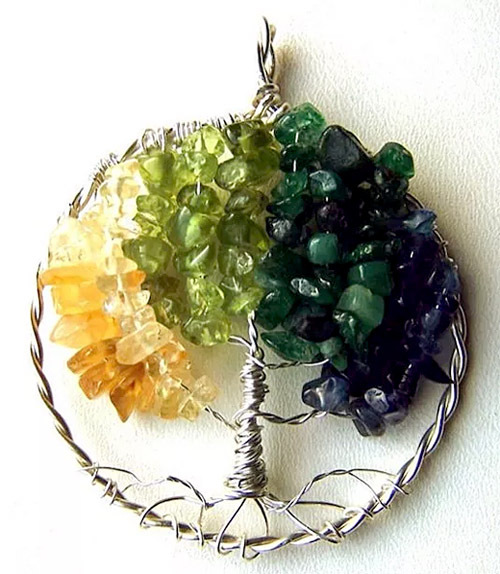 Janeice Frisbee, a 20-year Bancorp South employee from Humboldt, Tenn., said the dollar-coin-size necklace, which features colorful, uncut birthstones strung on sterling silver wire in the form of the "Tree of Life," deflected a .40-caliber bullet aimed at her heart. On the morning of March 18, police say Frisbee was accosted at her home by Dominic Williams and forced to open the Bancorp South branch, which was only a few blocks away. Once inside, Williams demanded that Frisbee open the bank vault, but she did not have that authority. The assailant then shot Frisbee twice at point blank range. “I couldn't do what he wanted me to do, and that's why he shot me," Frisbee told WMC Action News 5. 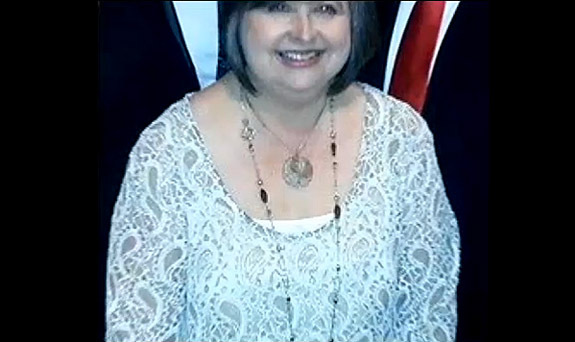 The first shot, which was aimed at the middle of her chest, never penetrated her body because it deflected off of the handmade sterling silver necklace that had been given to her as a birthday present by her son and daughter-in-law. According to The Jackson Sun, Frisbee sustained only minor injuries from the first bullet — a broken sternum and a bruise bearing the shape of her "Tree of Life" necklace. The second shot did more damage, but was not life threatening. The bullet hit her in the shoulder, went through her chest cavity and exited just above her heart. Despite the injuries, Frisbee was able to dial 911 as the assailant jumped out the bank’s window and fled on foot. Police captured the suspect minutes later. “They told me as they were putting me in the ambulance to take me to the helicopter that they already had him in custody,” Frisbee told WMC Action News 5. The twisted sterling silver wire necklace that saved Frisbee’s life was designed by Amanda Toddings of Colorado-based Mandala Rain, which specializes in Family Tree and Tree of Life necklaces and pendants. 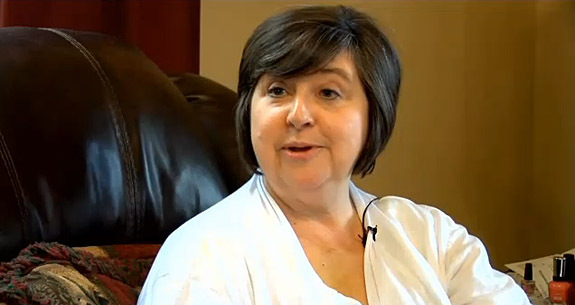 Frisbee’s daughter-in-law, Brandy, reported that, despite being hit by a bullet, the necklace is still intact. It may be a while before Frisbee gets it back because the FBI is holding it as evidence in the felony charges against Williams. The brave bank employee was hospitalized for only one day and is recuperating in her home with the support of family, friends and other well-wishers. 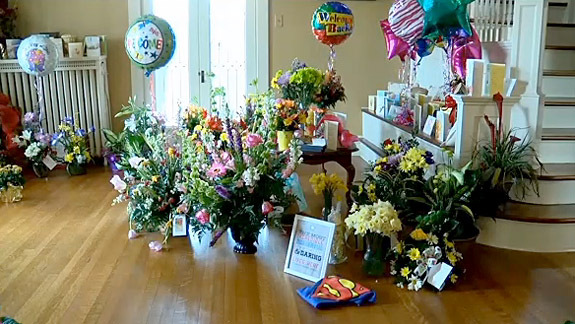 "They're sending cards, letters, flowers, gift cards — I'm just so amazed," Frisbee told WBBJ-TV. "I didn't even know I knew this many people." Credits: Jewelry photo via Mandala Rain. Other images: Screen captures via wmcactionnews5.com. 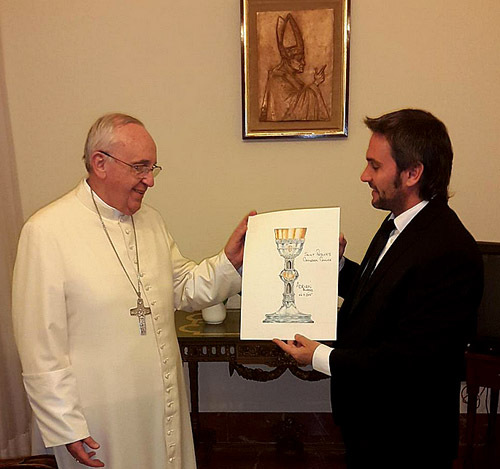 World–renowned Argentine silversmith Adrian Pallarols is giving Catholics from across the U.S. a unique opportunity to "be in Pope Francis’ hands" when he prays at New York's St. Patrick's Cathedral during his visit in September. The seventh-generation artisan is asking for donations of sterling silver jewelry and coins that he will melt down to fabricate a very special, all-American communion chalice. Specifically, the 43-year-old Pallarols made a plea for modest items, such as ”an earring, [or] a little ring you don’t use,” he told Time magazine. Pallarols’ silver strategy is steeped in symbolism. Even though most devotees will not be in attendance when the Pope celebrates mass at St. Patrick’s Cathedral in September, they can still play an important role in the momentous event. His appeal for mass participation aligns nicely with the story of how the majestic St. Patrick’s Cathedral came to be with the help of thousands of small donations from poor Irish immigrants. 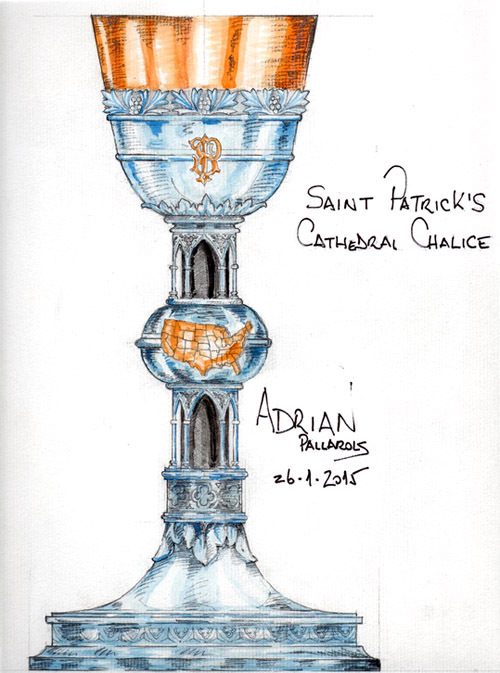 Other important symbols on Pallarols’ chalice include the distinctive Gothic architecture of St. Patrick’s Cathedral, a golden map of the United States in the center of the handle, and the golden intertwined initials “S” and “P” (for St. Patrick’s) on the cup. The exterior of the chalice will be crafted in donated silver, and the inside of the cup will be lined with gold, according to America magazine. The fabrication is set to take place in the basement of St. Patrick’s Cathedral during the few weeks before the Pope's visit. The expected outpouring of generosity will likely result in an overabundance of sterling items, far more precious material than can be used in a single chalice. Pallarols told America magazine that he guarantees that all the donated objects will be melted down into the ingot of silver from which the chalice will be made. The excess will be sold, with the proceeds going to the Pope’s efforts to assist the poor in the U.S. The Pallarols family has been designing extraordinary silver items for dignitaries and heads of state since the mid-1700s. 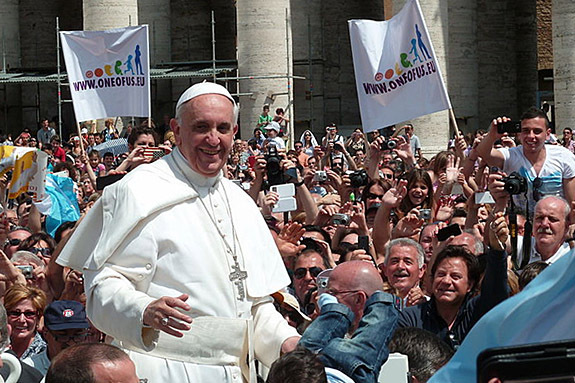 The family also has close ties with Pope Francis. When the Pope was still known as Cardinal Jorge Bergoglio, the archbishop of Buenos Aires, he presided over Adrian Pallarols' wedding. He later baptized Pallarols' daughter and frequently visited the artisan’s shop to chat about art and music, according to Time magazine. Images: Twitter/Andrian Pallarols; Crowd shot by Edgar Jiménez from Porto, Portugal, via Wikimedia Commons.